In this version: In-Game notification solutions, look at the solution while playing! Do you like play Ruzzle, Wordament or Twisted? Do you like win against your friends? 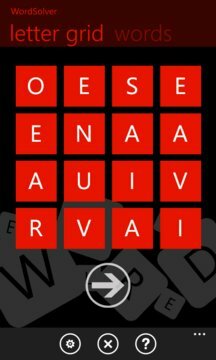 WordSolver is the app you're looking for! Insert the letters in the boxes and get the solutions! Win against your friends with WordSolver! 6 Languages are supported, 3 dictionary mode, path graphic, sorting options and even more!